Plantain weed, Plantago lanceolata, is a common in many backyards. This low-growing plant is bright green, has 5 to 9 deep veins on the leaves, and has a long shoot running up the middle. It’s commonly found in fields, roadsides and in backyard lawns. Plantain leaves and seeds are all edible. It’s new leaves are wonderful in a salad, but the older leaves should be cooked to reduce toughness. Plantain boasts being a great source of protein (25 g per 4 ounces) as well as being high in iron. This plant is also full of Vitamins A. C, and K. Also known as “broad leaf,” this has been commonly sprayed for to remove from lawns, so be careful where you are foraging for this. Plantain is generally less than 10 inches tall, including the flower shoot and will have shallow, short, thick roots. The stalk is approximately 1/2 inch thick. Leaves are oval shaped, 2-8 inches long and up to 3 1/2 inches wide. When plantain flowers, they will appear as small, greenish brown with a purple stamen. 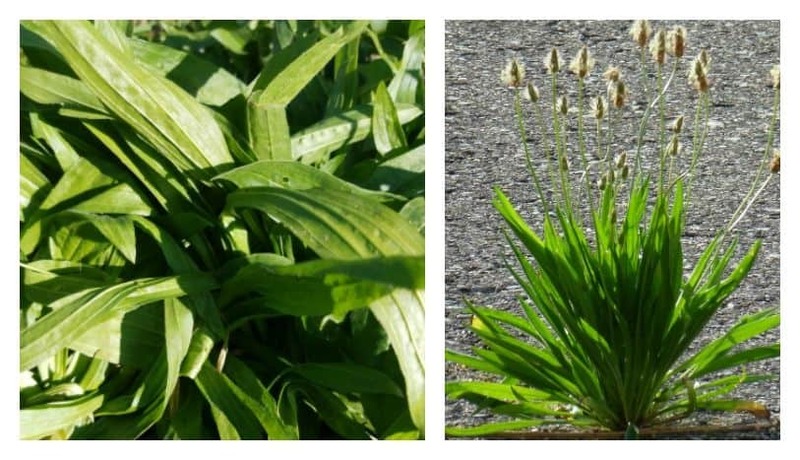 You can find plantain in all moderate climates, from Spring through the fall. Plantain leaf medicinal uses date back to the Ancient Romans and Greeks. Plantain is most commonly used topically, such as in a salve or poultice. Plantain can also be used in a tea or infusion. It is used for everything from bites, bruises, scratches to treating gasotrointestinal and respiratory infections. For example, my youngest was playing in his fort outside and out of nowhere, he screamed, “Ouch!” He had been stung. Since he is not allergic to bee stings, it was just a matter of easing the temporary owie. We grabbed the nearest plantain leaves, crushed it up and placed it on the site of the sting. His tears subsided as it began to feel better. There are no known contradictions for the usage of plantain and no known interactions, making it safe for anyone to use. 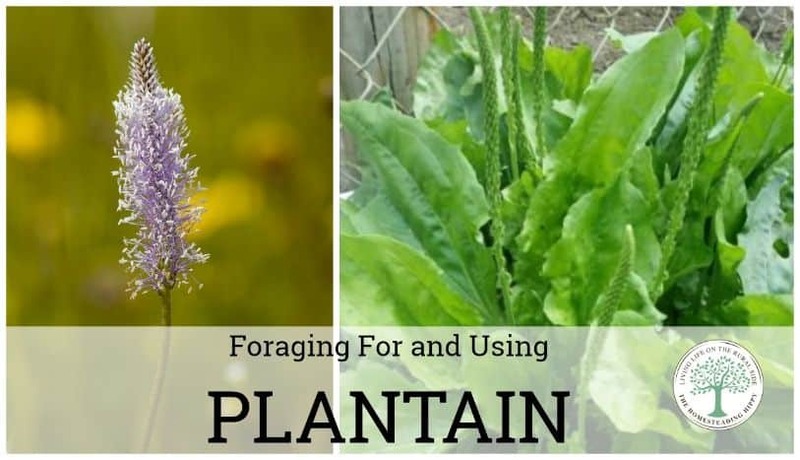 Plantain is common to most everywhere in warmer months, and many people do not realize its benefits. As a matter of fact, it is often referred to as “broadleaf” and is commonly sprayed with weedkiller to remove it. It will spread like wildfire in your yard, making it an invasive plant, but you can control it by removing some of the roots of some of the plants. Just make sure to leave some! Rinse the plantain leaves off, then lay them flat on a baking sheet. You can dry them in a low oven-170-200 degrees for 5 hours, or place in a dehydrator on low. You want the leaves to be completely dry, since any water can lead to mold or early spoilage of your salve. Once the plantain leaves are dry, crush them into a large canning or other oven safe jar. Cover the leaves with your choice of carrier oil. Once the leaves are covered, place in a 200 degree oven for 2 hours to allow the oil to infuse. Drain the oil, removing all the plant matter. At this point, you have a great topical oil that can be safely used. If you prefer a thicker ointment to carry around, add in 3 Tablespoons of beewax and place back in the oven to gently melt. Once melted, remove from the oven and give the oil and wax a gentle stir. If you desire, you can add up to 10 drops of your favorite essential oils. I like lavender for calming, helichrysm for its skin renewal, or sweet orange for a light, fresh scent. Pour into covered tins or a small jar with a tight fitting lid. Label with the ingredients and date prepared and store covered. To use, simply place about a dime sized bit of the plantain salve on the affected area and gently massage into the skin. This is great for stings, bumps, bites and bruises! Try this recipe for plantain leaves to enjoy the full flavor, too! 1. In a heavy bottomed skillet, melt the butter. 2. Add the onions and garlic, salt and pepper and stir. 3. Sauté for 2 minutes, allowing vegetables to sweat. 4. Carefully rinse and dry the plantain leaves. 5. Chop into 1 inch pieces. Add to the onion and garlic and sauté for 5 minutes. Serve as a side dish. What is your favorite use for plantain? Be sure to pin this for later!